Many articles discuss recovering single or multiple mailboxes from backup, but little on how to recover those personal archives (and no, recovering the mailbox doesn’t recover the personal archive, depending on your backup solution of course). I’d like to show you how to restore a personal archive using standard Exchange 2010 SP1 functionality and a backup, meaning we won’t use the dumpster and we won’t be using a lagged copy. Disaster strikes and you need to perform a full recovery of the personal archive. 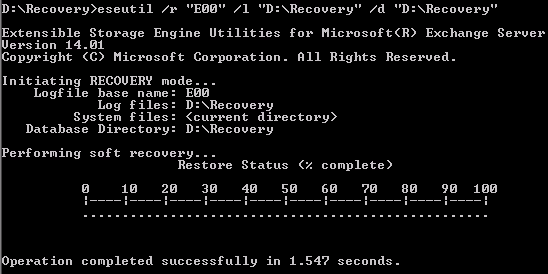 For completeness I’ll describe shortly how to restore a backup and create and mount the recovery database. First, restore the database and logs from backup (you do have a backup, right?) and use an alternative location to restore the files. In this example, the effective restoration path for the DB will be called <RestoreDBPath>, the path for the logs will be <RestoreLogsPath>. This will fetch UserID’s mailbox first and pass it to the New-MailboxRestoreRequest cmdlet using the required parameters. Note that, unlike Restore-Mailbox, you can’t filter on subject, timeframe, etc. You can however optionally specify a TargetFolder to restore content in a separate folder (otherwise content will be merged, like you may expect). The restore request is queued and you can monitor progress using Get-MailboxRestoreRequest. When the restore has finished successfully, the status will be set to Completed. The above procedure is great for restoring a single personal archive, but you can also use it to recover multiple mailboxes by passing a collection of mailboxes to New-MailboxRestoreRequest like shown above, e.g. This will select all mailboxes on a single database (which makes sense since the recovery database will only contain the backup of a single database) and filter the selection on users with a Displayname starting with a “p”. Those users’ personal archive will be restored using RecoveryDB. This entry was posted in Exchange 2010, Misc and tagged Exchange, Recovery, SP1 by Michel de Rooij. Bookmark the permalink. Very helpful post, thank you. Do you happen to know if you can do the same with Exchange 2010 RTM? The New-MailboxRestoreRequest cmdlet was introduced in SP1 and I can’t seem to figure out how to do this with the RTM release. Thanks Man , really helpful !! do you have to have the log files. I recall in a restore from a regular mailbox db this wasn’t needed. You need to bring the database in a clean state, usually meaning with log files: yes. If you haven’t got them or simply want to ignore log files (and possibly transactions), you need to use ESEUTIL in repair mode to bring the database in a clean state. ok yes that is what I did. It was in a clean state before I issued the restore request. Will the restored archive data only be viewable in the outlook client? Actually is there a way to restore this to another location (like a test account)? How do you retrieve the ArchiveGUID if the mailbox has long been deleted?